Aesthetic educational events, inevitably and appropriately, see a majority of the focus placed on the acquisition of practical clinical skills and techniques. 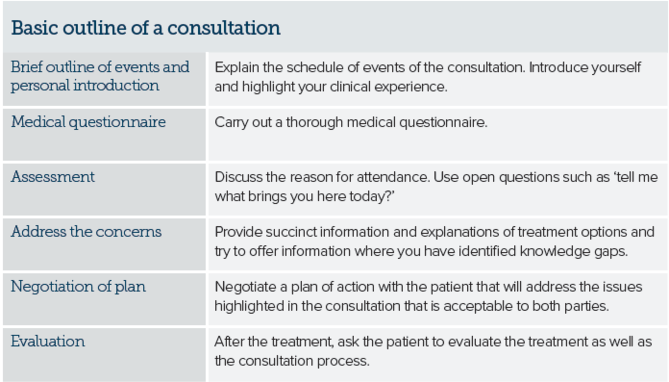 Effective consultation and its process, however, is something that is not often discussed in detail, but is an essential part of a successful practice in any setting. 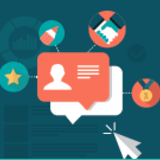 Do you know what the factors are that facilitate an effective consultation? How do you know when you have achieved that? Do you consciously work on improving the way you communicate with patients and colleagues? If not, why not? Before starting a consultation, we need to decide the ‘level of understanding’ that we need to establish. Due to the ever-present threat of litigation, we need our patients to develop and demonstrate competence of the treatments and the risks that surround them. Many of our patients, especially those seeking treatments for the first time, can be said to have a lack of knowledge and understanding regarding aesthetic treatments and their appropriate indications. This is hardly surprising when consumer media seems to pay so little attention to detail when reporting on aesthetic treatments. It is commonplace to see completely different terms or treatments used interchangeably in the consumer media, such as ‘botulinum toxin’ being injected into the lips when the journalist actually means dermal filler. In the context of education, a paper by Neighbour1 suggests that it may be possible for a ‘trainee’ to identify their own learning outcomes and therefore develop their own curriculum. This philosophy is one that can be replicated within the consultation in an aesthetic clinic. The length of a consultation will vary between practitioners and patients, but on average will last around forty-five minutes. Consultations, or ‘teaching sessions’ usually start with outlining the ‘format’ for the session, which can put the patient at ease by familiarising them with the process that they are about to experience. Also introduce yourself and highlight your clinical experience to help to facilitate the patient’s trust. The medical questionnaire can be given to the patient to complete or can be carried out as a joint exercise. Working through the questionnaire together may elicit more useful information and help build a picture of your patient and their lifestyle. As well as previous medical conditions, previous aesthetic treatments should be included in as much detail as possible. It is time to assess the patient’s goals or requests. Foley asserts that if an instructor is talking more than the learner, it may suggest that low-level learning is occurring.1 Whilst educating in this particular setting will entail a reasonable amount of information giving, allowing the patient to talk without interruption is a solid starting place to understanding the patient’s concerns and perspective and making the correct assessment. This process can be guided by open-ended questions such as, ‘tell me what brings you here today?’ Rather than ‘I see you are booked in for botulinum toxin?’ Reflective listening is another useful skill worth developing. Relay the information you have heard back to the patient. This will not only demonstrate that you are fully engaged with them but will also provide the option for either confirmation from the patient or clarification on any misunderstandings. The use of tools such as a hand held mirror or pictures can assist in visualisation and confirmation that accurate understanding has taken place. In addition, summarising what the patient says using phrases such as, ‘I am hearing that your main concern is the area around your eyes and that people often comment that you look tired, am I right?’ can confirm their concerns. Once the concerns have been established, it is possible to identify the treatment objectives. How do we address the patient’s concerns? This part of the consultation will require more information-giving and is where the ‘teaching session’ will primarily take place. As the practitioner, you should provide succinct information and explanations of treatment options and offer information where you have identified knowledge gaps. To help the patient understand, you can choose to make some brief notes, draw diagrams or offer them the opportunity to do so, always provide leaflets and directions to helpful web resources. It is imperative to use non-medical terms, which, despite being a cliché, is still common practice for many medical professionals. Research has also indicated that cultural differences between doctors and their patients inhibit effective communication for a number of reasons.4 Schouten et al, summarised these under five key headings; differences in health and illness models, differences in cultural values, differences in preferences for doctor-patient relationships, racism/ perceptual biases and language barriers.4 In the field of aesthetics it could also be added that cultural differences impact on perceptions of facial and body attractiveness. The impact of these differences is certainly made easier if the practitioner is working in areas that regularly engage with specific ethnic and cultural groups allowing for familiarisation with cultural norms for body image and the intricacies of communication. Likewise this may prove more difficult for practitioners whose exposure to a variety of ethnic and cultural backgrounds is limited to the occasional consultation. Whilst having an objective-based outcome, a skilled practitioner must have the ability to be flexible within a treatment process in order to respond to the unplanned situations arising from a clinical context.5 During the consultation there needs to be acknowledgement that things do not always go to plan – if this is understood by the patient then their experience can be improved in these potentially stressful events. At the end of this stage the practitioner should be confident that the patient understands and has developed competence of the options available, the contraindications, side effects and risks. If adequate assessment and identification of goals has taken place successfully and your patient has understanding of the treatments and risks, the negotiation of a treatment plan should follow easily. An effective consultation will also highlight those who could be described as ‘vulnerable’ and therefore unable to provide consent.6 This may be someone who has a poorly managed mental health problem or even someone who is simply experiencing a period of difficulty, which may be impacting on perceived benefits of undergoing a treatment. This point is important and the desire to please the patient or the desire for income must never override this. If any of these concerns are demonstrated during a consultation, then this must be tactfully and respectfully dealt with.7 These difficult scenarios may be managed by using phrases such as, ‘my feeling is that this treatment would benefit you more if we waited until you are feeling a bit better. I would really like to talk it through again in a few months. What do you think?’ It may be that the patient requires signposting to another service and so having a good knowledge of local services will facilitate your ability to do this. So for those who consider their communication skills to be already excellent, consider the proposed question, could you do better? The answer is indeed, we could all do better. 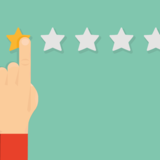 Getting the consultation right will inevitably improve the overall experience of your patient9 and will therefore increase the likelihood of ongoing retention. As practitioners, we also have a role and responsibility to educate our patients in order to ensure that the correct treatment is chosen and that informed consent has taken place. Neighbour R, The Inner Apprentice: An awareness- centred approach to vocational training for general practice, London: Petroc Press, (1988). Palomba CA, Banta TW, Assessment essentials: Planning, implementing, and improving assessment in higher education (1999). Stott N, Davies R, The exceptional potential in each primary care consultation, The Royal Journal of the College of General Practitioners, (1979). Schouten BC, Meeuwesen L, ‘Cultural differences in medical communication: A review of the literature,’ Patient Education and Counselling, 64(2006), pp.21-34. Paton B, ‘Knowing within: Practice wisdom of nurse educators’, Journal of Nursing Education, 46(2007), pp.488-495. Maksud DP, Cogwell Anderson R, ‘Psychological Dimensions of Aesthetic Surgery: Essentials for Nurses,’ American Society of Plastic Surgical Nurses, 15(1995) pp.134-190. Paul S, Applebaum M, ‘Assessment of patients’ competence to consent to treatment,’ The New England Journal of Medicine, 357(2007) pp.1834-1840. Weng HC, Chen HC, Chen HJ, Lu K, Hung SY, ‘Doctor’s emotional relationship and the patient-doctor relationship’, Medical Education, 42(2008), pp.703-711. Thom DH, Campbell B, ‘Patient-physician trust: an exploratory study’, Journal of Family Practice, (2016).